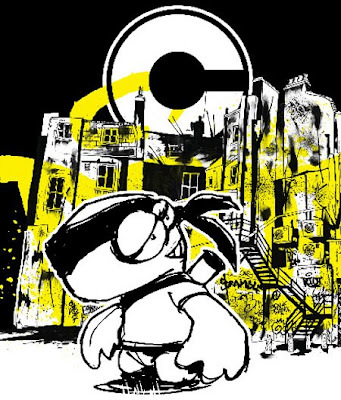 The All City collective present "City Escapades", a collaborative exhibition with the fictional character created by renowned UK based artist Ronzo Jonny Fu and British denim brand Lee Cooper. Set to open tomorrow 23rd July, the East London Art Collective goes West, taking residence in an amazing space at the heart of Covent Garden. They plan to create both a stunning pop up store and ephemeral exhibition space. The space will feature the launch of the collectives’ first series of 6 limited artist’s T-shirts alongside one-off artworks and prints. Also for the first time on British soil, the release of Jonny Fu’s plush toy, the 12” flute-playing kung fu master, who comes in a gigantic take-away noodle box. The space will play host to a light-box installation as well as a life-sized Jonny Fu delivery man. All City’s pieces will also include Lee Cooper jeans screen printed by the art collective. There will be a Private View to mark the store opening on the 23rd July with doors opening at 7 - 10pm. The pop up space and exhibition will then run from 24th July until 9th August and will be open every day 10am – 7pm.